The bombing of the Japanese cities Hiroshima and Nagasaki by the United States in 1945 was the first and only use of nuclear weapons against civilian targets. A series of studies began in its aftermath to measure the impact of the fallout, in terms of both the radiation dose to which the victims were exposed and the effects of this exposure on DNA and health in general. Continuing research that started in the 1980s under the leadership of physicist Sérgio Mascarenhas, Full Professor at the University of São Paulo (USP), Brazilian scientists have published an article in the journal PLOS ONE describing a method of precise measurement of the radiation dose absorbed by the bones of victims of the nuclear bombs dropped on Japan. The investigation was conducted during the postdoctoral research of Angela Kinoshita, currently a professor at Universidade do Sagrado Coração in Bauru, São Paulo State. Her supervisor was then Oswaldo Baffa, Full Professor at the University of São Paulo's Ribeirão Preto School of Philosophy, Science & Letters (FFCLRP-USP). "We used a technique known as electron spin resonance spectroscopy to perform retrospective dosimetry. Currently, there's renewed interest in this kind of methodology due to the risk of terrorist attacks in countries like the United States," Baffa said. As Kinoshita explained, the study is unique insofar as it used samples of human tissue from victims of the bomb dropped on Hiroshima. "There were serious doubts about the feasibility of using this methodology to determine the radiation dose deposited in these samples, because of the processes involved in the episode," she said. "The results confirm its feasibility and open up various possibilities for future research that may clarify details of the nuclear attack." The equipment used in the investigation was purchased during a project coordinated by Baffa and supported by the São Paulo Research Foundation – FAPESP. In the 1970s, when he was teaching at the University of São Paulo's São Carlos Physics Institute (IFSC-USP), Mascarenhas discovered that X-ray and gamma-ray irradiation made human bones weakly magnetic. The phenomenon, known as paramagnetism, occurs because the hydroxyapatite (crystalline calcium phosphate) in the mineral portion of bone tissue absorbs carbon dioxide ions, and when the sample is irradiated, the CO2 loses electrons and becomes CO2-. This free radical serves as a marker of the radiation dose received by the material. "I discovered that we could use this property to perform radiation dosimetry and began using the method in archeological dating," Mascarenhas recalled. His aim at the time was to calculate the age of bones found in sambaquis (middens created by Brazil's original inhabitants as mounds of shellfish debris, skeletons of prehistoric animals, human bones, stone or bone utensils, and other refuse) based on the natural radiation absorbed over centuries via contact with elements such as thorium that are present in the sand on the seashore. On the strength of this research, he was invited to teach at Harvard University in the United States. Before leaving for the US, however, he decided to go to Japan to try to obtain samples of bones from victims of the nuclear bombs and test his method on them. "They gave me a jawbone, and I decided to measure the radiation right there, at Hiroshima University," he said. "I needed to prove experimentally that my discovery was genuine." Mascarenhas succeeded in demonstrating that a dosimetric signal could be obtained from the sample even though the technology was still rudimentary and there were no computers to help process the results. The research was presented at the American Physical Society's annual March Meeting, where it made a strong impression. Mascarenhas brought the samples to Brazil, where they remain. "There have been major improvements in the instrumentation to make it more sensitive in the last 40 years," Baffa said. "Now, you see digitally processed data in tables and graphs on the computer screen. Basic physics has also evolved to the extent that you can simulate and manipulate the signal from the sample using computational techniques." Thanks to these advances, he added, in the new study, it was possible to separate the signal corresponding to the radiation dose absorbed during the nuclear attack from the so-called background signal, a kind of noise scientists suspect may have resulted from superheating of the material during the explosion. To make the measurements, the researchers removed millimeter-scale pieces of the jawbone used in the previous study. The samples were again irradiated in the laboratory using a technique called the additive dose method. "We added radiation to the material and measured the rise in the dosimetric signal," Baffa explained. "We then constructed a curve and extrapolated from that the initial dose, when the signal was presumably zero. 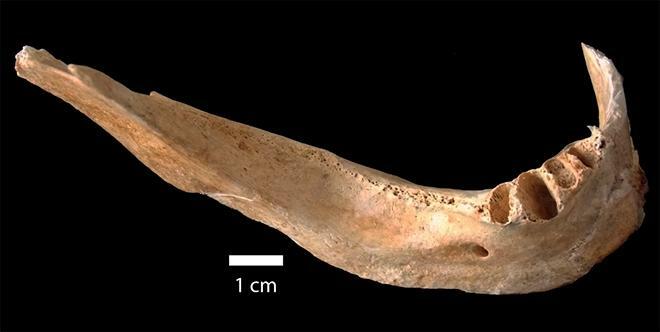 This calibration method enabled us to measure different samples, as each bone and each part of the same bone has a different sensitivity to radiation, depending on its composition." Thanks to this combination of techniques, they were able to measure a dose of approximately 9.46 grays (Gy), which is high in Baffa's view. "About half that dose, or 5 Gy, is fatal if the entire body is exposed to it," he said. The value was comparable with the doses obtained by other techniques applied to non-biological samples, such as measurement of the luminescence of quartz grains present in brick and roof tile fragments found at the bomb sites. According to the authors, it was also close to the results of biological measurement techniques applied in long-term studies using alterations in survivors' DNA as a parameter. "The measurement we obtained in this latest study is more reliable and up to date than the preliminary finding, but I'm currently evaluating a methodology that's about a thousand times more sensitive than spin resonance. We'll have news in a few months," Mascarenhas predicted.